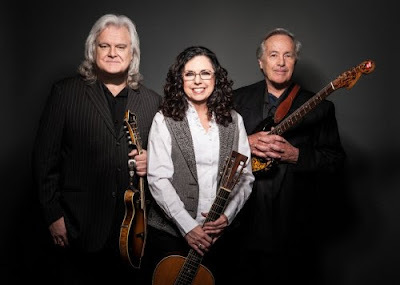 The touring trio of guitar virtuoso Ry Cooder, country and bluegrass legend Ricky Skaggs and country songbird Sharon White has proven to be a hit show as critics around the country continue to rave. Since kicking off in Salt Lake City last June, the "Cooder-White-Skaggs" tour has awed concertgoers and reviewers alike. After attending the group’s first concert date, Christie Gehrke of Salt Lake Magazine wrote, "The trio especially hit their sweet spot when harmonizing. They were backed by an exceptional band, most notably the 84-year-old Buck White—father of Sharon White—on piano. At some point in nearly every song, Skaggs would exclaim, 'Get it, Buck!' and the octogenarian would riff. Because this tour is a family affair, it also featured Joachim Cooder on percussion and sister Cheryl White singing back-up." "The guitar giant's (Cooder) delicate, rootsy riffs swirled with Ricky Skaggs' twangy mandolin and fiddle. His baritone crooning anchored songbird Sharon White's gospel harmonies. His back-to-the-beginning plucking elevated the legendary tinkling of Buck White's grand piano," says Jason Blevins of the Denver Post. Jon M. Gilbertson of the Milwaukee Journal-Sentinel noted, "Skaggs was predictably fine on fiddle and mandolin, while Cooder added a banjo to a rack of guitars, all played with his characteristically thoughtful, exploratory confidence." On Buck White's piano playing, the Minneapolis Star-Tribune's Jon Bream raved, "The 84-year-old played the perfect boogie woogie, gospel riffs or honky tonk licks. He earned probably the loudest cheers of the night when he practically turned into Jerry Lee Lewis during Skaggs' 1981 country hit, 'Don’t Get Above Your Raisin.' Buck did his daughters (Sharon and Cheryl) and son-in-law (Skaggs) proud." The "Cooder-White-Skaggs" tour brings master multi-instrumentalists Ry Cooder and Ricky Skaggs alive on stage to deliver a revelatory program of blues, gospel, and bluegrass. They are joined by Sharon White, one of the purest voices in country music, Joachim Cooder on drums and Mark Fain on bass with occasional guest performances by Buck White and Cheryl White of The Whites. The tour continues through 2015 with upcoming tour stops in Charlotte, NC, Knoxville, TN, San Francisco, CA, Seattle, WA, Portland, OR, New York, NY and more.